Mattresses differ in how they handle your body and contour to your shape. Firmer mattresses will not contour as much and seem a little stiffer, while softer, more plush mattresses will morph to your body shape. All of these mattresses are under $1000. Some of them are in the mid-range racket, while others are near the top end. Take note which mattresses are on sale and retail for more, and which ones are consistently under the $1000 threshold. Companies work hard to make their product sound good. The best way, then, to make sure the mattress is quality, is to see how customers feel after using it for a while. Compare reviews of those who received it for free or discount, and those who paid full price. The thicker a mattress is, the more likely it is to last longer. Also, the number of layers a mattress has, potentially the more comfort, support, and breathability it can supply. Longer warranties mean more time for you to use the product and be able to send it in if it malfunctions or needs replaced. Also be sure to find reviews on if the warranty is hassle free or difficult to take advantage of. Tuft & Needle – This bed has been made to distribute weight evenly across the entire mattress. It has excellent heat distribution, making sure you don’t overheat or get chilled easily during the night. Made in the United States, it comes with a 10 year warranty. If you or your sleeping partner get up during the night, this mattress offers localized movement so that the other person isn’t woken. This queen mattress is a budget to mid-range item. Sleep Innovations – Catered specifically to side and back sleepers, this mattress is a medium-firm support made of gel memory foam. It is made in the United States and comes with a 20 year warranty. The top layer is breathable foam, which allows you to stay cool during sleep and wake up more refreshed. This product specifically states that it is for bodies that are slightly bigger or larger than average. This is a budget to mid-range item. DynastyMattress – The sleeping surface of this mattress is a 2″ quilted Euro-Top, excellent for comfort. This is a memory foam mattress and morphs to your body’s shape as you sleep. The fabric reacts to the temperature of your body and keeps you comfortable all night long. This 15″ thick mattress sells is mid to high range item and is allergen and dust-mite resistant. Some customers have stated that it feels like a TempurPedic, but is much cheaper and worth the cost. 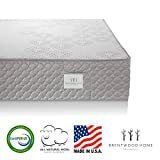 Brentwood Home S-Bed – The Brentwood mattress is unique in that it is made with a certified organic latex layer on top. This mattress is includes 2″ of gel memory foam and another 2″ layer for airflow. It is 11″ thick total. The surface is made of all-natural wool, which is an excellent temperature control as you sleep and keeps the surface clean. It is CertiPUR-US certified, safe for sleeping on and void of harmful chemicals. Made in the United States, this mattress retails online for roughly $950. It has a medium-firm feel with a high support level. LUCID – This mattress is 16″ thick and great for those with sensitive skin. 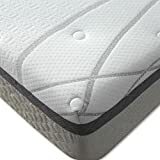 It’s hypo-allergenic surface sits on top of a 1″ quilted bamboo charcoal memory foam layer, another 3″ of memory foam, a comfort layer, and a base of 10″ of high-density foam. It provides excellent spinal support to alleviate pain, and with open cell technology, it keeps your body shape for a long time. It is Certi-PUR certified with no harmful chemicals. There is a 25-year warranty and it has a medium-plush feel. It has excellent customer reviews that remark on it’s firm and yet soft feel and comfort. It is a high-mediuim range item. Mattresses have a few different things that need to be considered before picking the winner. Here are some things you should consider when buying a new queen mattress. Mattresses are made of and filled with different things. The main types that you will find are memory foam, memory foam, gel, latex, innerspring, and pillow top. Most of these types of mattresses use foam as well as a different material. Memory foam retains your shape as you sleep, providing better support. Gel mattresses can give better heat dissipation. Pillow top mattresses have an additional layer on top to provide extra comfort. The firmness of your mattress can be one of the biggest obstacles to your comfort while sleeping. Some experts say that firmer mattresses offer better rest and support on the spine. While a softer mattress may be beneficial for those with back injuries or problems, you will want to find a mattress that allows your spine to rest in a way that lets your lungs open up and breath deeply during sleep. While a good mattress may be a good mattress, the reliability and guarantee of the brand goes a long way in assuring you that your purchase is a quality one. Do a little research on the brand of the mattress in question to be sure they are reputable. CertiPUR certification on mattresses means they have tested free of heavy metals, ozone depleters, PBDE flame retardants, formaldehyde, and phthalates. It also has better air quality and is love in VOC emissions. This entry was posted on February 29, 2016 by admin.